How Sold: In slabs as close to 16″ x 24″ as possible. Contact us today to purchase some for your yard project! Landscape Use: Ground cover, around base of tree & shrubs, between pavers on a shady garden path. Description: Alongside algae and mushrooms, moss was one of the earliest plants to emerge on land about 540 million years ago. Because it has no roots, moss was able to survive because it got nutrients from waves of water splashing over it. The moss in your garden today still needs plenty of water to survive. It will perform best when planted in the winter, so it can peak with spring rains. Moss does best in shade, and it will thrive in compacted and poorly drained soil. Planting Instructions: Although moss doesn’t put down roots into the soil, it does prefer soil rich in iron, a soil amendment you can buy at garden stores. An acidic soil for mosses, with a pH from 4.5 to 6.0, is recommended, which you can test with a kit from a nursery. Dig the hole 16” wide by 24” long and 1-1/2” deep to accommodate the slab. Water thoroughly to settle the soil and give plants a good start. Plant the moss slabs in moist soil and water every other day for the first year. Care & Maintenance: It’s most important to keep them free of fallen leaves, twigs and weeds. A few passes with a rake, leaf blower or shop vacuum will remove debris that causes moss to brown out. Do this once in spring, once in summer and twice in the fall. 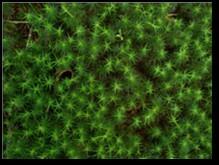 Even in damp areas, a little extra water will help mosses grow more quickly and luxuriantly. They need little if any fertilizer because it can burn moss while encouraging weeds. The pH of soil can also help or hinder mosses. Many species thrive in highly acidic soils (pH below 5.0), so by lowering the pH with powdered sulfur you can encourage mosses while discouraging weeds and lawn grasses that prefer a sweeter soil. Mosses will do best in a damp, shady location which has less competition from other plants, where even ferns may struggle. Diseases & Pests: While they are resistant to most pests & diseases, some air pollutants and poor ozone quality can potentially harm mosses.